Donor governments provide a significant share of global funding for family planning services in low- and middle-income countries.14 Therefore, tracking donor government expenditures is a key part of accountability efforts and important for informing global stakeholders. The Kaiser Family Foundation (KFF) initiated a family planning resource-tracking project last year, adapting the methodology it has long used to monitor donor government spending on HIV.15 Data for the project was first provided for 2012, establishing a baseline for monitoring commitments toward FP2020. This year’s report presents data from 2013, the latest year available across donor governments. It is based on data from 26 governments which were members of the Organisation for Economic Co-operation and Development’s (OECD) Development Assistance Committee (DAC) in 2013 and had reported Official Development Assistance (ODA) to the DAC. Of these, 11 made specific commitments at the 2012 London Summit to increase funding for family planning: Australia, Denmark, the European Commission, France, Germany, Japan, South Korea, the Netherlands, Norway, Sweden and the United Kingdom. Others, including the United States and Canada, while not making specific financial commitments at the Summit, also provide funding for family planning activities. In 2013, donor governments provided US$1.3 billion for bilateral family planning programs and US$454 million in core contributions to UNFPA. Bilateral funding from donors totaled US$1.3 billion in 2013, representing a 19% increase (+$211.4 million) compared to 2012 (US$1.1 billion). Seven donors (Canada, Denmark, Netherlands, Norway, Sweden, US and UK) increased bilateral funding in 2013 (after exchange-rate fluctuations are taken into account), while one (Australia) remained essentially flat and two decreased (France and Germany). Most of the bilateral increase was driven by the US, followed by the UK and the Netherlands. The US was the largest bilateral donor in 2013, providing US$585 million and accounting for almost half (45%) of total bilateral funding. 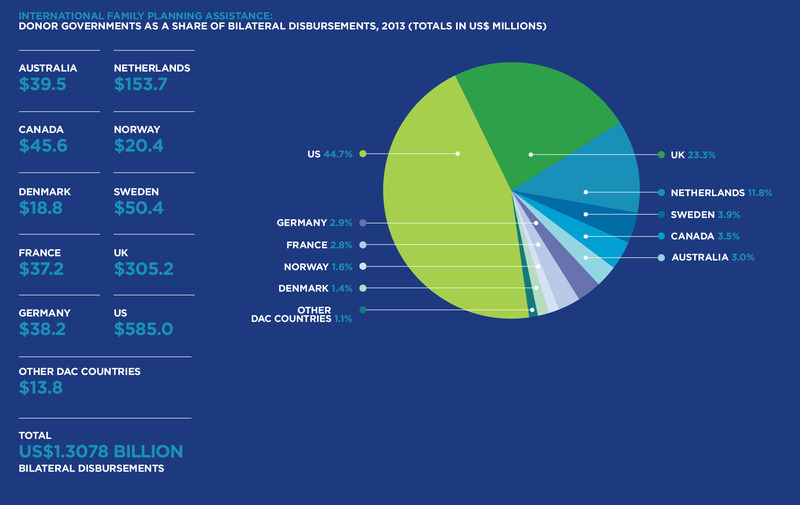 The UK (US$305.2 million, 23%) was the second largest bilateral donor, accounting for nearly a quarter of all funding, followed by the Netherlands (US$153.7 million, 12%), Sweden (US$50.4 million, 4%), and Canada (US$45.6 million, 3%). UNFPA core contributions from DAC member governments totaled US$454 million in 2013, representing a US$22 million (5%) increase over 2012 (US$432.2 million). Most of the increase was driven by Norway, along with combined funding from other DAC donor governments. Among the donor governments profiled, Norway provided the largest core contribution to UNFPA in 2013 (US$70.6 million), followed by Sweden (US$65.8 million), the Netherlands (US$52.4 million) and Denmark (US$40.4 million). Among the ten donors profiled by KFF, eight made commitments during the 2012 London Summit on Family Planning: Australia, Denmark, France, Germany, the Netherlands, Norway, Sweden, and the UK. Preliminary estimates indicate that all eight of these donors have made progress toward fulfillment of their commitments. The financial data presented in this analysis represents disbursements defined as the actual release of funds to, or the purchase of goods or services for, a recipient. It was obtained through direct communication with donor governments, analysis of raw primary data and from the OECD Creditor Reporting System (CRS). UNFPA core contributions were obtained from United Nations Executive Board documents; however, KFF was unable to determine what share of these core contributions is attributable to family planning specifically (since such funding is also used to support broader population, reproductive health, maternal and newborn health, HIV and related efforts). Similarly, it is also difficult in some cases to disaggregate bilateral family planning funding from broader reproductive and maternal health totals, and the two are sometimes represented as integrated totals (Canada, France, the Netherlands, Sweden and the US do not disaggregate family planning funding from broader reproductive and maternal health totals). In addition, family-planning-related activities funded in the context of other official development assistance sectors (e.g., education, civil society) have remained largely unidentified. 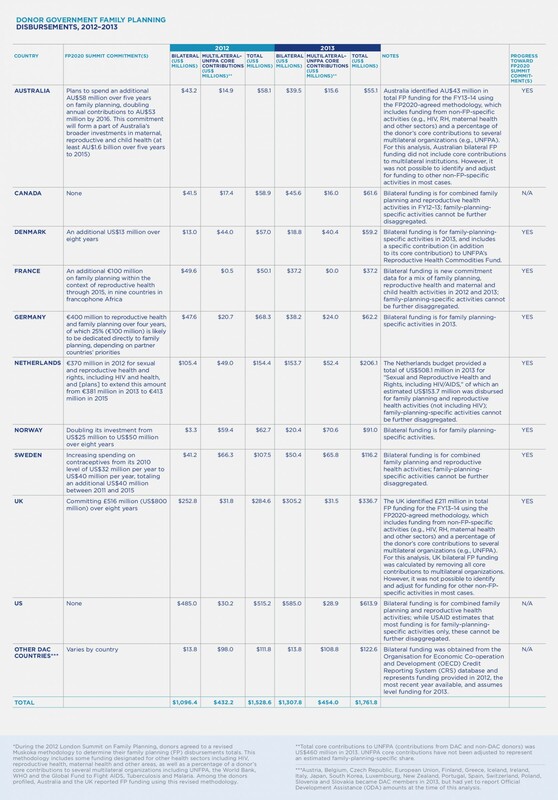 For purposes of this analysis, KFF worked closely with the largest donors to family planning to identify such family-planning-specific funding where possible (see Table notes). Going forward, it will be important to make efforts to track donor government support for family planning if such funding was more systematically identified within other activity categories by primary financial systems. 14. UNFPA, Financial Resource Flows for Population Activities Report 2011, 2013. 16. Includes funding from 25 DAC member countries and the European Union (EU); Poland, Slovenia, and the Slovak Republic became DAC members in 2013, but have yet to report Official Development Assistance amounts. 17. Family Planning 2020, London Summit on Family Planning: Summaries of Commitments, May 2013. 18. Core contributions by donors to UNFPA are usd to support a range of projects for family planning, reproductive health, maternal and newborn health, and HIV by UNFPA; data provided here could not be adjusted to represent an estimated family-planning-specific share. 19. In 2013, Finland provided the fourth-largest core contribution (US$46.8 million) to UNFPA, followed by Denmark.